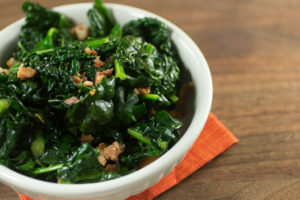 These hearty greens get tons of flavor from crisp bacon, and are loaded with nutrients. 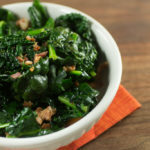 Use sturdy greens like collards or chard that will hold up nicely to a braise. Cook the bacon in a heavy straight-sided skillet. Remove with a slotted spoon and set aside. Add the garlic and the greens to the pan and sauté for a minute or two. Add the broth, and bring to a low simmer. Braise for 10 minutes, until greens are tender and liquid is reduced. Stir in the lemon juice and turn off heat. Stir in the reserved bacon and serve. Looks good yet I don’t see instructions anywhere. Could you add them to the recipe?